CELEBRATE the New Year with Chef Audrey Lim’s Chipotle Oxtail Stew, one of the recipes from her book, Malaysian Tapas. The dish is good for those entertaining friends and family. • Sear the oxtail and beef shin in a pan with olive oil andsizzle until golden brown. • Pour in the tomatoes, sun-dried tomatoes, chipotle chilli, celery, cinnamon stick, cloves and star anise. Bring to a simmer for approximately 2½ hours. Add water if needed to keep mixture above the meat. When the oxtail softens and the beef shin is tender, remove and place them in a bowl. • Separately, mix the potatoes with the carrots. • Prepare the roux by heating up the butter and olive oil. Add flour and stir until it thickens to a soft, pastry-like texture. Set aside to be used as a thickening agent. • Leave the stew mixture to cool slightly before blending whatever is left in it until smooth. Bring it back to a boil and add shallots. • Allow the stew to simmer for 10 minutes before adding the roux. Stir evenly, then add sea salt and ground black pepper to taste. 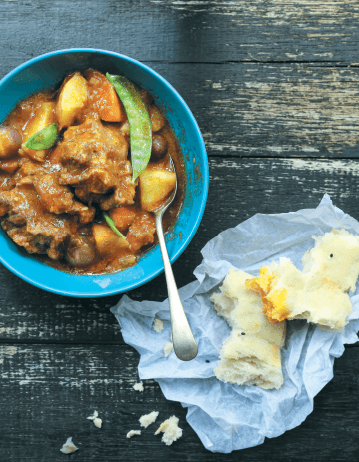 Place the oxtail and beef shin back into the simmering stew and serve hot with crusty, warm bread. • Chipotle is a smoke-dried jalapeno. It is used primarily in Mexican and Mexican-inspired cuisine. You could substitute chipotle with dried chilli or chargrilled bell peppers. The peppers need to be charred in the beginning, then skinned and seeded. Add it to the stew at the second step of the recipe. However, substitutes could alter the taste of the stew. Audrey Lim is the chef behind Malaysian Tapas, the latest addition to the MPH Masterclass Kitchens’ series. Her compilation is inspired by her maternal grandmother who taught Lim the beauty of marrying flavours in the kitchen. Malaysian Tapas, priced at RM39.90, is available at all MPH bookstores. This article first appeared in The Edge Financial Daily, on December 30, 2014.